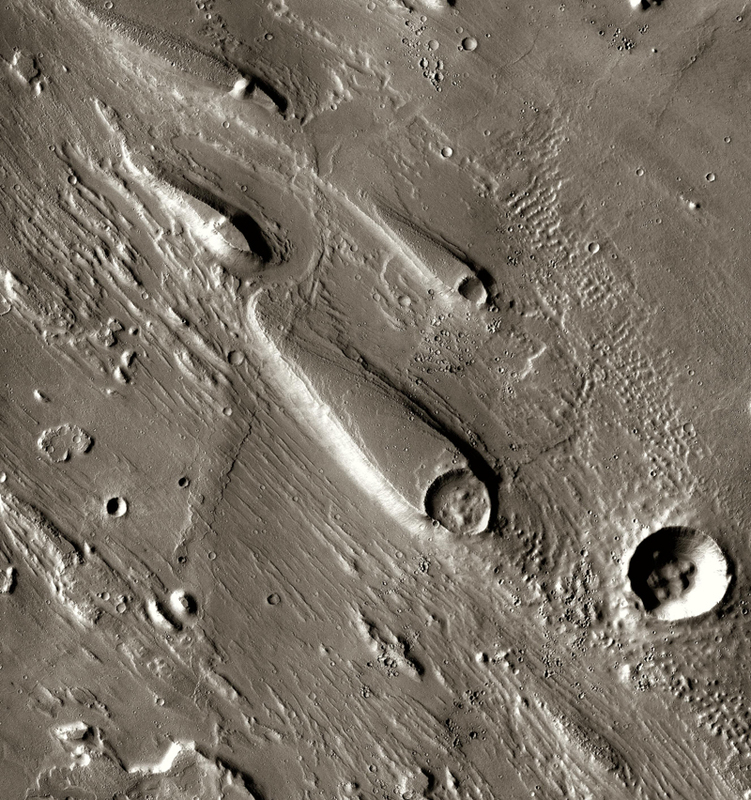 This picture from NASA's Mars Odyssey orbiter spacecraft shows teardrop-shaped mesas in the Ares Vallis region of Mars. These are the remnants of mesas that were carved into their present shapes by catastrophic floods of liquid water that flowed from lower-right to upper-left. Scientists estimate that the floods had peak volumes many times larger than the flow of today's Amazon River. The floods happened billions of years ago, as shown by the fact that impact craters -- even a few large ones -- overlie the carved terrain. Still, images like this one show that Mars had a warmer, wetter climate in the distant past, almost certainly with a much thicker atmosphere than it has today. It is possible that life got started on Mars during this more benign time. We do not know whether it survives today, although there are interesting hints that it might survive. This image will be featured in the third-last lecture of the course. This web site provides the syllabus and class procedures and rules for the 2016 AST 301 courses. All dates are now correct for 2016. The grade curve is correct and will not be changed. This is a Java tutorial that gives you some feeling for the scales of things (both large and small) that we will discuss. There are small inconsistencies between the above map and the one that I show in class, e. g., in Australia, where the posted map does not show three, half-hour time zones meeting at one place. Countries frequently make changes in their time zones; the posted map (from 1997) is slightly out of date. During the 2000 Millennium celebration, the time zones were as I show them in class. Movie illustrating the Doppler effect for sound. Light behaves similarly, but "lower pitch" corresponds to a color shift toward the red. Watch the light on top of the police car change color as the pitch of the sound changes. Of course, in reality, the blueshift (at the beginning) and the redshift (at the end) would be extremely tiny at the speed of a police car. Movie of how the Moon's phase, size, and apparent Earthside face change over a month. I show a movie similar to this in Lecture 2. Mars: Browsable pictures from orbit -- like Google Earth -- showing stunning detail. Try both "Visual" and "Elevation". The elevation maps come from satellite radar altimeters. The Inner Solar System Now! Dates in the following text are for Spring 2016. This course is an introduction to astronomy for non-science majors. We start with explanations of the seasons on Earth and of what you see when you look up at the sky. Two lectures cover the history of astronomy from the ancient Greeks until the Renaissance. The history of astronomy is also the history of the development of the way that we do science; we will see why science is so successful in teaching us new things. Throughout the course, I try to show you how we learn things about our Universe. I then discuss stars - their formation, life histories, and deaths. This section includes a discussion of our Sun. From stars, we expand our horizons to the study of galaxies of stars and of the Universe as a whole. We look back in time to the beginning of the Universe to give us perspective on how everything around us was created - everything from the stuff that you and I are made of all the way out to the most distant stars. Given this perspective, we then return home to our Solar System. I describe the planets, moons, comets, and asteroids, and I put our planets into context by comparing them to the planets that astronomers are now finding around other stars. All this leads up to a discussion of our Earth, of the history of life on Earth, and of the prospects that there is life elsewhere in the Universe. The emphasis throughout the course will be on conceptual understanding of the "big picture". You will be astonished by how much we can learn about places far away and long ago. It helps if you had high school science courses, but I do not expect this or require it. I will - as much as possible - start each subject from the beginning. There is only a little math in the course, and even people who have "math anxiety" usually find that the math is not a big problem. I will use "scientific notation" for large and small numbers, and I will introduce about half-a-dozen equations that describe how nature behaves. You never need to memorize equations. If you need them on exams, I will give them to you. But you need to understand what they mean and how to use them. Here is a question that is typical of the reasoning that you may be asked to apply: Your SUV has a 20 gallon tank for gasoline, and you can drive 24 miles with one gallon of gas. If you want to drive 1000 miles, how many times will you have to fill the tank? Most of the mathematical reasoning involves ratios and proportions, and all of the arithmetic that I ask you to do during exams can be done without a calculator. Horizons: Exploring the Universe by Michael Seeds and Dana Backman, published by Brooks/Cole and available at the Co-Op. You can get the 11th, 12th, or 13th Editions. Older editions are not bad. If you get one, then you will have to be careful about reading assignments: the pages and section numbers mentioned in assignments will correspond to the 13th Edition and may not correspond to those in earlier editions. Important: Buying the text is optional. Most people find it helpful to have a textbook in which they can read another author's description of the things that we talk about in class. However, all class slides will be posted on this class web site. Therefore, you can get through this course without having a textbook if you study and understand the material that I cover in class. VERY IMPORTANT: I strongly recommend that you attend classes. Astronomy is not intrinsically difficult, but it is probably unfamiliar to you, and it is much harder to understand the material if you only read about it. Also, I will omit some subjects that are in the book, and I will lecture on other subjects that are not in the book. You will be responsible for the content of the lectures. I will post the lecture slides well in advance. Don't let the convenience of posted slides and lectures fool you into thinking that you can skip class. The in-class lectures are an important part of the education experience. If you skip classes and study only from the postings, chances are that you will pass the course but that your grade will be lower than it could have been. This is not because I am nasty to people who skip classes (I'm not) but rather because you will not know the material as well. Note that I am teaching two sections of AST 301 back-to-back. This presents you with some opportunities and with one constraint. The opportunity is to listen to a lecture twice if you have trouble understanding it. If you have the time and the need, I do not mind if you come to both lectures on any given class day, as long as we don't run out of seats. If seating gets tight, please give priority to the people who are registered in a given section. The constraint is this: During exams, I will have to ask those of you who are in the earlier section (Unique number 46845) to stay in the room until the end of the test, even if you are finished. Please bring something to read and try not to disturb the people who are still working on the test. The reason is that I will combine the grade lists for both sections. I want to be fair and to give everybody the same exams. If you have trouble understanding something in the course, please ask questions in class or come and see me. I will be happy to discuss the problem with you. The TAs are also available. Review sessions will be scheduled prior to exams and homework due dates. even if I am out of town. Astronomy is an observational science. My research depends in part on visits to various observatories, including the University's McDonald Observatory in west Texas. Also, occasionally, I have to attend an out-of-town meeting. If I miss a class for these or any other reasons, the class will meet as usual. You may be interested in the Astronomy Department's regular evening star parties, when you can see some of the objects that we discuss in class through one of our telescopes. They happen on Wednesday nights on the roof of RLM and on Fridays and Saturdays at Painter hall. Please see this link for details.. The University of Texas at Austin provides upon request appropriate academic accommodations for qualified students with disabilities. For more information, contact the Office of the Dean of Students at 471-6259, 471-4641 TTY. Also, please notify me of any modification/adaptation that you may require to accommodate a disability-related need. Specialized services are available on campus through Services for Students with Disabilities. There will be 5 in-class exams (see the syllabus). Four of these will follow and cover the 4 major sections of the course. The fifth is essentially a makeup exam that follows Section 2. So the first half of the class will end with 2 exams over 3 class days (with a help session in between) ending at the start of Spring Break. If you take all 5 exams and do all the homework, you will have 6 scores, each worth 20 % of your final grade. We will then drop your lowest score and average the rest. There will be no final exam. There is no penalty for missing any one exam or the homework as long as you get 5 total grades (either 4 exams and the homework or 5 exams and no homework). For this reason, there will be no makeup exams, not even for valid reasons such as medical or family emergencies. If a class is cancelled by the University because of bad weather (usually snow and ice), then we will use the help session class between tests 2 and 3 for a makeup test. In the initial schedule as posted on the syllabus, you get 5 tests precisely so that we can lose one test because of unforeseen circumstances. Bad weather is an unforeseen circumstance like any other; the only difference is that it affects all of us. But that's why we start out with some flexibility (5 tests) in how you earn your grades. But I do not like it when everybody loses a test to bad weather, so this is the ONLY circumstance in which I will change the syllabus to replace the in-class help session with a test. Then losing a test because of bad weather will not result in a loss of all your flexibility with exams. That is, even if we lose one class because of bad weather, you still get a total of 5 tests and you still need only 4 tests plus your homework to make up a complete final grade. I emphasize again: THERE WILL BE NO MAKEUP EXAMS, EVEN FOR VALID (E.G., MEDICAL) REASONS. Please don't ask. I will be polite, but the answer will have to be "no". Homework assignments will have a due date that is 2 weeks from when the homework is distributed. Late homework will not be accepted unless you have given me and I have accepted your reason for requesting an extension prior to the due date. No homework will be accepted after I have discussed the answers in the help session that preceeds each exam. Homework is optional (see below). Here's another description of how we will get your final grade: You can get 6 scores, each of which counts 20 percent of your grade, for 5 tests and all four homeworks averaged together. We will then drop your lowest score and add up the other 5. This means that you can decide not to do the homework and still be OK if you take all the tests. But if you miscalculate and have to miss a test AND you decided not to do the homework, then I cannot help you to make up a fifth score by giving you a makeup exam or other extra credit work. So think carefully before you decide not to do the homework. If you decide to do the homework, please make sure that you do all 4 homework assignments. 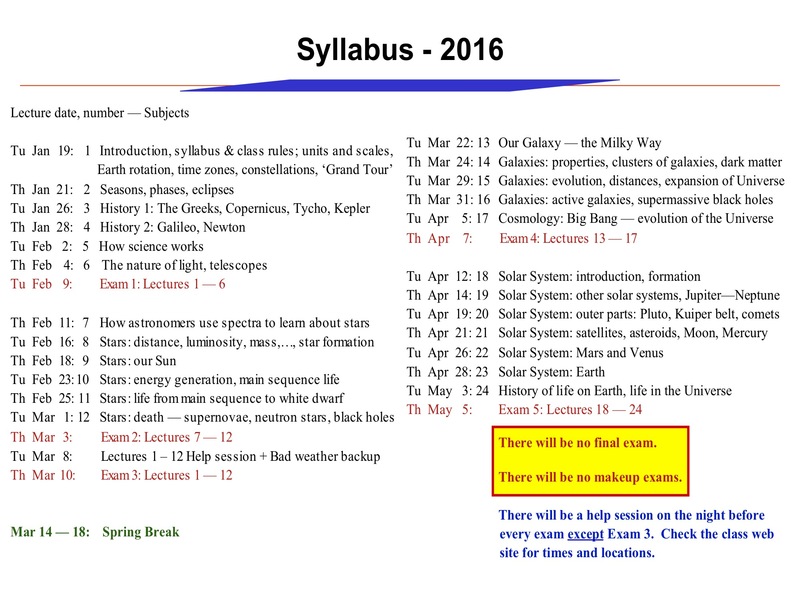 Exam dates: The syllabus lists the dates of the exams. I promise not to change these dates. Please note the dates of the exams, since it is impractical to schedule makeups. Substituting exam 3 for one of the other exams gives you flexibility in case you have to miss a test. Copying during exams is a crime for which the punishment will be at least an F for that exam and very possibly an F for the course. I will not hesitate to report cheating to the Dean of Students. University standards of academic integrity are posted here. All work handed in for grading must be your own work. It is OK to discuss homework with a friend, but it is important to use your own thoughts and words in writing your answers. If you are puzzled by a question, do not copy a friend's answer. Instead, please discuss the problem with me or with a TA. Don't be shy! We are here to help! If we see evidence for copying, such as two detailed but identical answers, then both students will get zero for that question. In cases of widespread copying, both students will get zero for the whole homework and may get reported to Student Judicial Services. Recommendation: When you write homework solutions, show intermediate steps; don't just write down the answer. When the TA grades the homework, he or she needs to see how you thought about the problem. If you get the wrong answer but thought about at least some of the problem correctly, you get partial marks. If the intermediate steps are not shown and the answer is wrong, we can't give you any partial marks. Important: If you get the correct answer but show none or almost none of the steps that you went through to get the answer -- in other words, if we cannot tell that you did the work to get the answer -- we will give you only 50 % of the full marks. Laptops can be used in class to keep up with the slides that I show. All slides will be posted well in advance of the lectures. If you want to make notes using your laptop, this is OK. Alternatively, you may want to print out the slides in advance and take notes on the printouts. Either way, you will find that you need to take some notes but not a lot of notes. During classes, please do not use laptops for web browsing that is not related to the course. Cell phone use is not allowed, please. NO TEXTING DURING CLASSES. Information on astronomy courses and on Departmental rules are posted in the Astronomy Department's Memo to Undergraduate Astronomy Students Copies are handed out on the first day of classes. The University's deadlines and rules regarding dropping the course will be strictly enforced. I will assume that you know the deadlines and the rules. Deadlines are listed in the University's Calendar for Fall 2015 - Spring 2016. 1. Adds/Drops before the 12th class day: During the first four class days, students may add or drop courses online. The 2016 Spring 4th class day is January 22. During days five through twelve, students may drop a course online but must go to the department offering the course to seek permission to add a course. Be advised that some departments do not allow adds/drops after the fourth class day. Students who wish to add a class after the twelfth class day will be required to see a counselor in the Student Division of the Dean's Office and provide justification for the proposed change. The 2016 Spring add/drop day (12th class day) is February 3. 2. Dropping a course during the open Q-drop period: The 2016 Q drop period ends on April 4. A student who wants to drop a course can ask the instructor to complete a drop form that assigns a Q or an F. The symbol Q indicates an average of C or better at the time of the drop, or that no grade has yet been assigned, or that due to the student's performance and the nature of the course, no academic penalty is in order, or that for documented non-academic reasons, no academic penalty is in order. Again, the 2016 Spring Q-drop deadline is April 4. I never refuse a request to Q-drop this course. 3. The deadline for dropping a course or for changing to credit/no credit or for withdrawing from the University for urgent nonacademic reasons is April 4, 2016. 4. 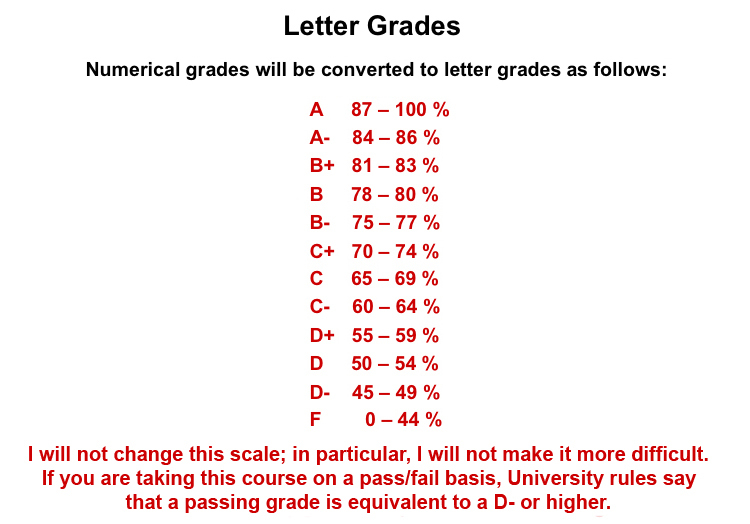 Courses taken on a pass/fail basis: The University defines a D- as a passing grade for undergraduate students. The instructor is obliged to assign a grade of CR (Credit) for a student registered on a pass/fail basis who has a D- or better in the course. It is important that the roster indicate the student is registered for the course on a pass/fail basis. Otherwise, a letter grade must be assigned. There is a time limit for students to change courses from a grade basis to pass/fail basis and vice versa. It is the same as the final deadline for drop/withdrawal for academic reasons. After that deadline, students should see a Counselor in the Student Division of the Dean's Office. Students are allowed to change the status of any given course only one time during the pass/fail time period.